New Mexico sunrise guitar; photo by Pimental & Sons Guitarmakers (all rights reserved; used by permission). 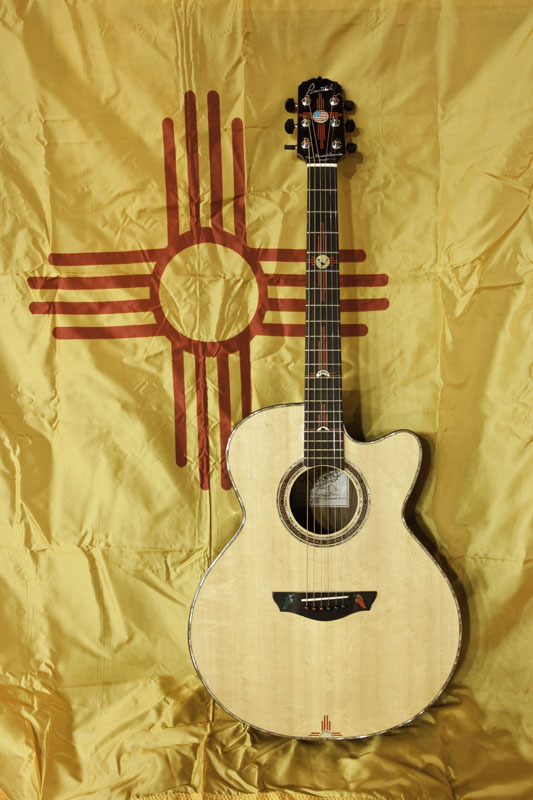 The New Mexico sunrise guitar was designated the official state guitar of New Mexico in 2009. The New Mexico sunrise is a custom guitar designed and handcrafted by Pimentel & Sons Guitarmakers. The guitar features inlaid Zia sun symbols. Taking more than a year to craft, the New Mexico Sunrise guitar is adorned with inlays of coral and mother-of-pearl. It has 10 types of aged wood from around the world.